Champaner, the historical city of Gujarat, is located just 7 hours from Mumbai towards the north, making it a great weekend destination. The city was founded by the Chavda dynasty's king, Vanraj Chavda, back in the 8th century. Some believe that Champaner was named after the King's friend, Champa. Dotted with forts, palaces, mosques and more, Champaner has a beautiful ancient aura, that makes you travel back to the time when these magnificent monuments were built. These monuments, along with Jain and Hindu temples that are over 1000-years-old, are all well-maintained. 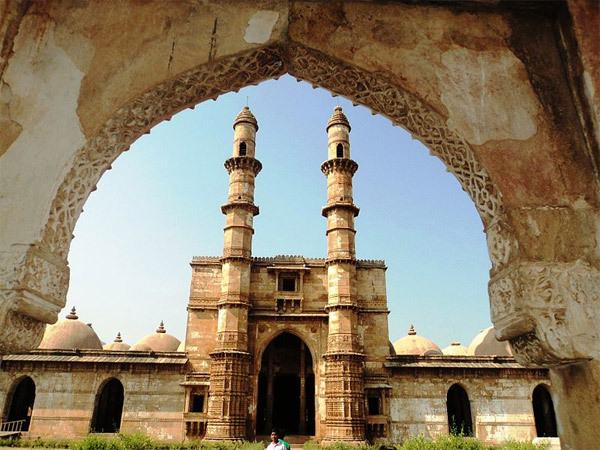 Champaner was briefly the capital of Gujarat, but after the Mughals took over the state, the capital status was moved to Ahmedabad. Champaner-Pavagadh Archaeological Park, which has been declared as a UNESCO World Heritage Site, is one of the most popular places of interest in Champaner. Since summers in Champaner can be unbearably hot, the best time to visit the city would be between the winter months of October to February. The weather is pleasantly cool during this time, but can drop to temperatures as low as 9 degree Celsius in the night. So it is advised to carry warm clothes. The route to Champaner from Mumbai is quite easy, since most of the journey must be made on the highway. It takes 7 h 30 min to complete the journey of 465 km. Vasai is a beautiful suburban town, located 60 km from the city of Mumbai. The town has quite a few secluded places that are breathtaking. Chinchoti Waterfalls is a popular picnic spot, which is also visited by trekkers. Vasai Fort or the Bassein Fort is a ruined relic that was built in the 16th century, by the Portuguese. The fort is now used as a shoot location by moviemakers. The songs "Hymn For The Weekend" by the British Band Coldplay, and "Lean On" by Major Laser and DJ Snake, were shot in this very location! The capital city of Dadra and Haveli, Silvassa, is located 126 km from Vasai. Due to the heavy influence of the Portuguese in the past, Silvassa is dotted with numerous churches. Silvassa is home to two beautiful gardens, namely, Vanganga Lake Garden and Hirwa Van Garden. Apart from the gardens, Vasona Lion Safari is a popular tourist attraction, which takes you through a part of Dadra and Haveli Wildlife Sanctuary to witness Asiatic lions. Udvada is a town popular for housing the ancient Zoroastrian Fire Temple, Udvada Atash Behram. Well known as the Iran Shah or "King of Iran", Atash Behram in Udvada is one of India's Parsi temples that dates back to the 8th century. Atash Behram literally translates to "Victorious Fire", which is an important pilgrimage site for Zoroastrians from all over the world. It is a classic representation of India's cultural connection with Iran. Formerly known as Suryapur, Surat is a port city of Gujarat that is famous for its food and for polishing rough diamonds. Surat's version of pani puri, khaman (a dish similar to Dhokla), surti locho (steamed snack made of gram flour) are some of the snacks that simply cannot be missed on a visit to Surat. Dutch Garden, Science Centre, Surat Castle or Surat Fort, Chintamani Jain Temple, are some of the many places that can be visited in Surat. Nestled at the mouth of river Narmada, Bharuch is a port city that involves mostly in the trade of spices and silk between the east and the west. It is connected from Ankleshwar through a bridge known as the Golden Bridge, that was built by the British in 1818. Since it is settled on the banks of the holy river Narmada, Bharuch is flanked with many temples. Apart from temples, tourists can visit Lallubhai Haveli which is a beautiful fort that was built in 1791. The beautiful city of Vadodara is filled with many tourist hotspots, of which the most popular is the beautiful Lakshmi Vilas Palace. This magnanimous palace is said to be four times the size of Buckingham Palace and spreads across an area of 700 acres. The palace was built by Maharaja Sayajirao Gaekwad III in 1890, and the palace continues to be the royal household of the Gaekwads. Hazira Maqbara, Kirti Mandir, Sayaji Baug, Sursagar Lake are some places that must be visited in Vadodara. Read further to know about the places that must be visited in Champaner. Declared as a UNESCO World Heritage Site in 2004, the park is filled with historical and cultural heritage, with remnants from the 16th century Gujarat. These monuments include stepwells, tanks, fortresses, mosques and tombs from the past. The transition from a prevalent Hindu culture to a Muslim heritage is evident from these monuments. The park is a huge land spread across 3,000 acres so it might take an entire day to visit all these places. Some of these monuments include, Kevada Masjid, Sahar ki Masjid, Jain Temple, etc. The park remains open from 8.30 am to 5 pm. Read on to know about some of these monuments. Jama Masjid is one of the many mosques in the Archaeological Park of Champaner. It is believed that 25 years were taken to build this beautiful Jama Masjid. This fine two-storeyed mosque shows a clear amalgamation of Muslim and Hindu architecture. The exquisite designs carved on the ceilings, minars and minar bases reflect the architectural splendour of artisans of that era. Kevada Mosque, Lila Gumbaj Ki Masjid, Nagina Masjid are some of the other beautiful mosques found in the park. The Kalika Mata Temple is perched on the pinnacle of the Pavagadh Hill, also found in the Archaeological Park, is a prime Hindu pilgrimage site. The temple has images of three goddesses. Goddess Kalika Mata's image is in the centre, images of Goddess Kali on the right and Goddess Bahucharamata on the left. A trek up the long flight of stairs will take you to the breathtaking temple of Kalika Mata. It is particularly crowded during festivals. Lakulisa and Jain temples are the two other temples that must be visited. Located at a distance of 20 km from Champaner, Jambughoda Wildlife Sanctuary is home to a picturesque and undulating landscape, that has carpets of green, two water reservoirs and a forest with lush thickets. The sanctuary is home to wildlife species such as lions, tigers, Indian leopards and Indian sloth bears. The forest thickets mostly consist of bamboo and teak trees.